From trusted British farms. Working with selected farmers that we trust, to ensure high welfare standards and consistent quality. We select only the best cuts of pork for our sausages to give a succulent and tender eat. 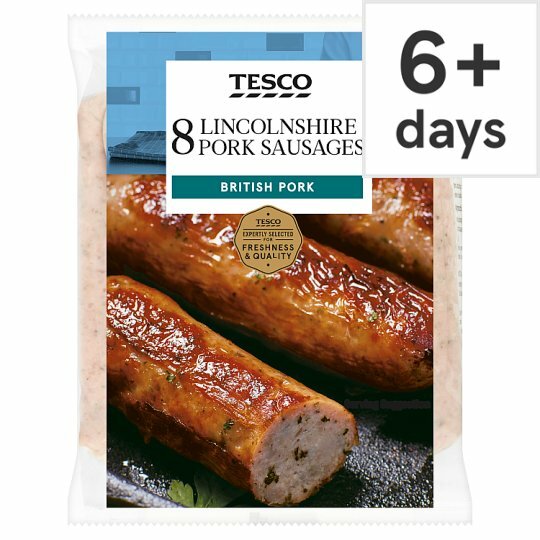 INGREDIENTS: Pork (72%), Water, Wheat Flour (Wheat Flour, Calcium Carbonate, Iron, Niacin, Thiamin), Salt, Sage, Emulsifiers (Disodium Diphosphate, Tetrasodium Diphosphate), Parsley, Ginger, Raising Agent (Ammonium Bicarbonate), Preservative (Sodium Metabisulphite), White Pepper, Mace, Antioxidant (Ascorbic Acid), Citric Acid, Sunflower Oil, Sage Extract, Thyme Extract. Instructions: For best results, grill. Place under a pre-heated medium grill for 16-18 minutes. Turn occasionally.